Social research plays an important part in the social sciences and in the planning and implementation of personal social services. Whilst considerable attention has been paid to the methods used to undertake social research, little has been done to explore the processes under which it is carried out. 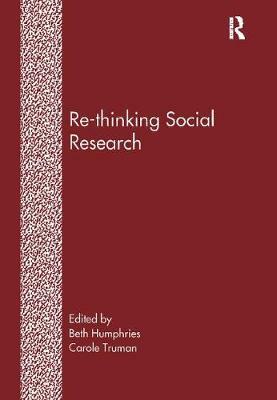 This volume explores the process of social research from an anti-discriminatory perspective. Contributors address themes connected to every aspect of social research from its design, through fieldwork to implementation of findings. Papers adopt critical perspectives to explore issues to do with many aspects of power and 'difference' in research including the power of black feminist research, issues in collaborative research, anti-discriminatory methodologies, quality of life in people with learning difficulties and participatory research. The book addresses many key issues which have been at the centre of current social debate and offers a unique contribution to the literature on research methodology. As such, it is likely to have a wide readership with both academic audiences and practice based welfare professions.